An archipelago of Portugal, Madeira is often overlooked in favour of other Portuguese destinations like Lisbon or the Algarve. Now here’s why this beauty shouldn’t be. Composed of four islands of ever impressive volcanic landscapes and natural splendour – once you’ve set foot on the Madeiran ground, you’ll be hooked, line and sinker. If you are unsure where to start, don’t worry we’ve got your back. We’ve mapped out a 7-day Madiera itinerary, full of outdoor pursuits, our favourite eateries and more. If you are looking for stretches of white sandy beaches, then Madeira is not for you. The coastline is not expansive because of the many of the cliff precipices jutting up from the sea. There are very few white sandy beaches due to the historic volcanic activity on the island but there are stunning black sand beaches. ?️ Despite the lack of beaches, there are actually three white sand beaches in the whole of the Madeira archipelago. The longest, at 9km, is Porto Santo Beach which is a 2-hour ferry from Funchal on the island of Porto Santo. ?️ Now, the other two white sand beaches on Madeira island have been created with imported sand. You can find these beaches at Calheta and Machico. ?️ As we already mentioned Madeira is home to other-worldly black sand beaches. Our favourite two and the most popular are Seixal and Laje. These beaches can be found in the top right-hand corner of the island. ?️ Whilst the beaches are far and few between, Madeira is home to some fantastic natural swimming pools. 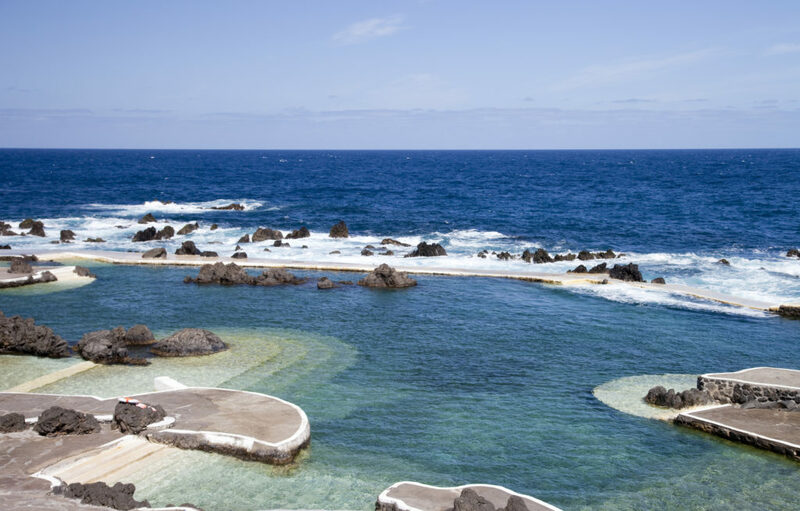 Porto Moniz has some pools in the volcanic rock which is very cooling and has healing properties (supposedly!). 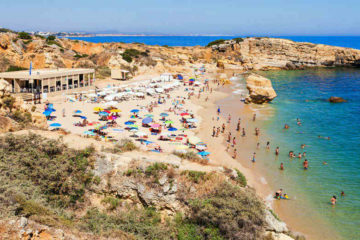 Doca do Cavacas is also a seaside town with some natural rock pools – perfectly safe for you and your little ones. ?? 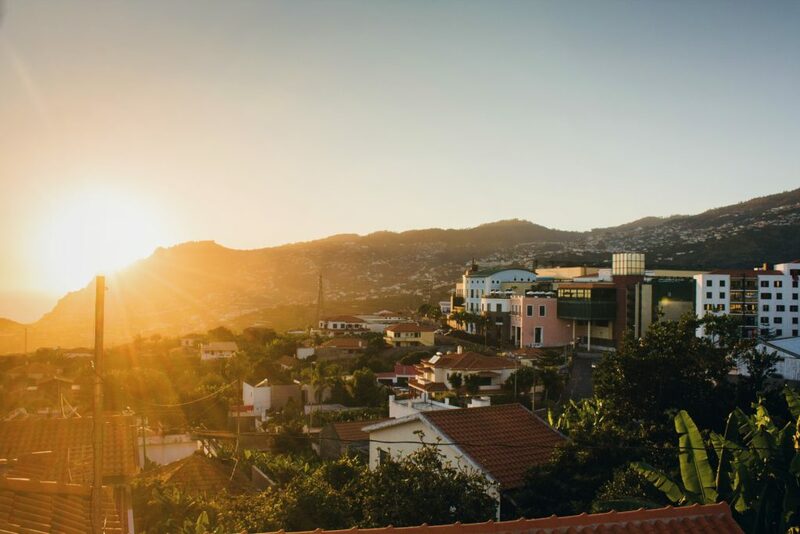 Spend a day in one of Europe’s cleanest and most picturesque cities, Funchal. The main city in Madeira has plenty to see and great nightlife. Top attractions include the Farmer’s Market, taking a trip on the cable car and a wander through the Monte Palace tropical gardens. ?? Face your fears at the cliffs of Cabo Girão. Formed centuries ago by a volcano, these cliffs are some of the highest in Europe, at 580m above sea level. If you’re feeling brave you can walk over the glass skywalk where there is a near vertical drop of over 500 meters down below. Visiting Cabo Girão and the skywalk are both free! ?? The Santa Catarina Park is situated overlooking Funchal’s port. With glorious sea views, verdant flower beds and a glistening lake this park is perfect for an afternoon wander. ?? The highest peak on the island, Pico Ruivo is a great place to feel like you’re walking in the clouds. There are magnificent views stretching across the whole island featuring the stunning landscapes. ?? Step back in time at The Parque Florestal das Queimadas on one of the levadas walks. Levadas were constructed on the island as canals to collect and transport rainwater. As important as these waterways are for irrigation, they are also used by tourists and locals for accessing more remote parts of the island where there are no tarmac roads. ⛰️ Madeira Outdoor is an active tour company. So, whether you prefer to be on foot, on a bike or on a stand-up paddleboard – they have a tour for you! ⛰️ The Atlantic waves in Madeira are perfect for surfers, but regardless of skill level, Calhau Surf School offers surfing lessons and surfboard rentals. ⛰️ Ponta de São Lourenço is one of the most picturesque corners of the island. It is a long thin peninsula on the eastern end of the island with spectacular cliff views. You can complete the 4km walk to fully appreciate the striking rock formations. ⛰️ The 25 Fonte Falls walk is a stunning trail following one of the island’s levadas, passing through the natural landscape and some waterfalls. You will feel as though you have walked onto the set of Jurassic Park! 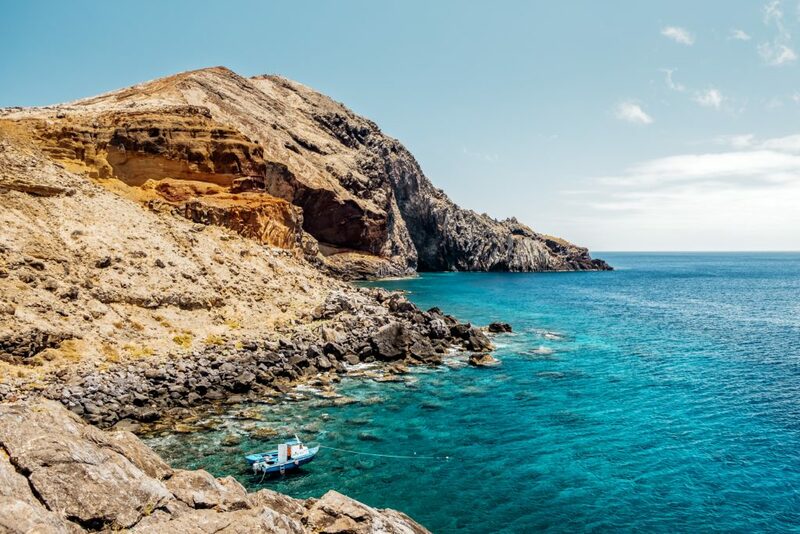 ⛰️ On the island of Porto Santo, there are many areas of natural beauty. Pico de Ana Ferreira is the highest point on the West of this island. Here, there are some beautiful and intriguing rock formations, reminiscent of Giant’s Causeway in Ireland.
? Madeira Aqua Park is open during the summer months and is a great place for children to cool down and expend some energy (if they have any left!).
? The Whale Museum is the perfect stop for rainy days. This museum houses life-size models of whales and dolphins – and they even show 3D movies. It also teaches and promotes scientific research projects dedicated to the conservation of marine life in the seas of Madeira.
? After a trip to the São Vicente Caves, your children will be able to truly appreciate the volcanic activity of the islands. As well as having a Volcanism centre, the labyrinth of caves is a wonder to behold!
? For any football fanatics or Cristiano Ronaldo fans a quick stop off at the CR7 Museum is a must. Commissioned by the man himself, the museum houses all of Ronaldo’s 125 awards (there’s even an extra room for future trophies), old football shirts and wax figures of the footballing legend for you to take photos with.
? 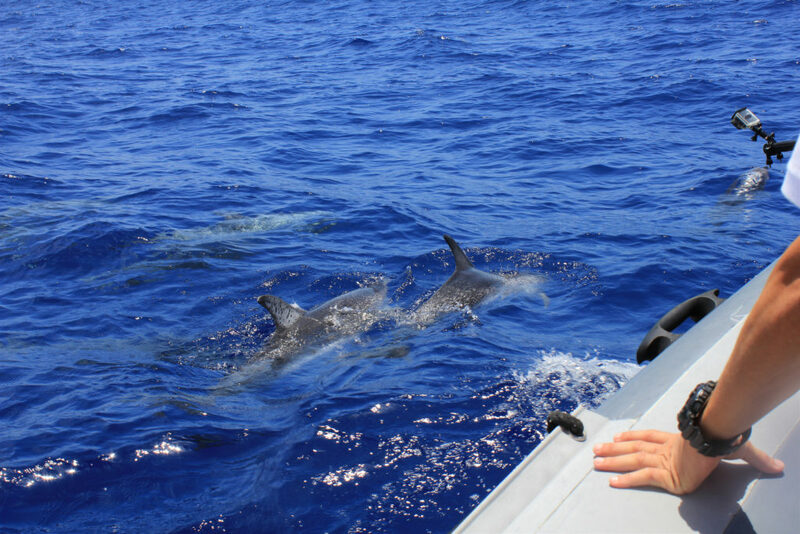 Madeira’s waters are home to schools of whales and dolphins, the latter being particularly easy to spot on a boat tour. Magic Dolphin is a boat tour company offering either speedboat or catamaran trips daily.
? During the grape harvest (late August – early September), Madeira celebrates its annual wine festival. 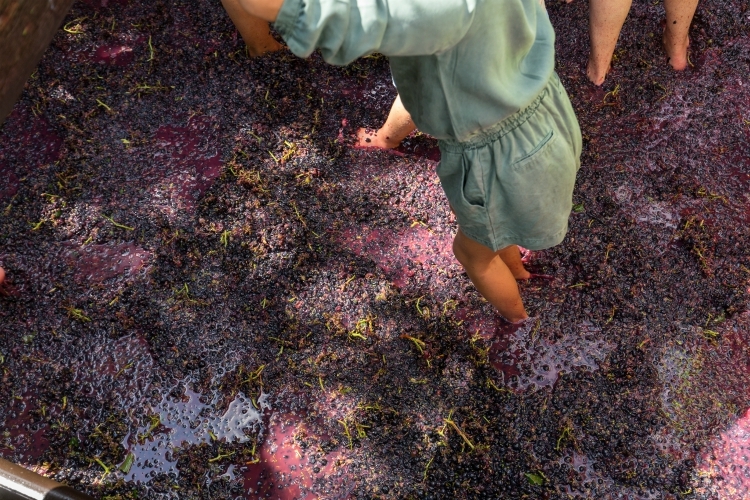 This event aims to recreate the old traditions of Madeira, which were developed over centuries of labour in viticulture. Everyone is welcome to join in the crushing of the grapes. Much like Spain’s La Tomatina, this is a fun activity for all!
? Zarcos has some of the best steaks on the island. The service is brilliant, as are the views across Funchal and with such reasonable prices there really is no better place for some Portuguese food!
? Il Gallo d’Oro, the only two-star Michelin restaurant on the island serves an exquisite menu, curated by Benoit Sinthon. It serves sophisticated, gourmet Portuguese cuisine with a strong influence of Mediterranean cuisine.
? Blandy’s Wine Lodge is one of the Madeira’s prime vineyards. They offer tours of the vineyard in an array of different languages with a tasting at the end. These happen all throughout the week and at only €5,90 per tour it would be rude not to, wouldn’t it? ?
? The Petit Fours Patisserie has a selection of the Portuguese pastries, cakes and sweet treats in Funchal. Don’t miss the Portuguese delicacy pastel de nata they are absolutely sublime.
? O Tasco serves fresh and lovingly made local Madeiran cuisine at great value prices. A hit with the locals too. That’s our 7-day Madeira Itinerary finished! So, if you’re raring to get your island adventure started, get in touch with our concierge team.